Pollinators are organisms that aid in the transfer of pollen to allow for the fertilization of plants essential to fruit and seed production. While some plants, such as grasses, have very light pollen, which can be transferred by wind, about 80% of flowering plants are dependent on pollinators to help them transfer their pollen. A pollinator goes to a flower seeking nectar and, in the process, pollen from the male part of the flower sticks to the pollinator's legs or other parts of its body. When it flies on to another flower of the same type, the pollen is deposited on the female part of the plant. This allows the plant to reproduce by creating seeds and fruit. Bees are the principal pollinators, but there are other important pollinators as well, including other insects such as flies, moths, butterflies, wasps, some beetles as well as hummingbirds. Some bat species are also pollinators, however none of these are found in Canada. The work of pollinators benefits all of us every day, whether it is the grapefruit we have at breakfast, the carrots we snack on during the day, or the cotton pajamas we put on before we go to bed. Canada’s diverse pollinators are forever busy making sure we have the produce we need to survive. Apples, blueberries, grapes, watermelon, carrots, squash, cocoa, cotton, cherries, and peaches are just a few examples of the crops which are dependent on pollinators for their production. Many wildflowers also rely on pollinators. Without their services we would not be able to grow the majority of our food crops or enjoy the flowers around us. And yet many of these valuable creatures are under threat. Many of the pollinators we depend on are under threat, and some crops are showing decreases in production due to a shortage of pollinators. Farmers now have to import and raise pollinators to ensure good production of their crops. 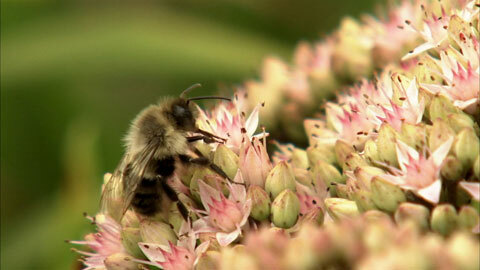 The main threat facing pollinators is loss of their habitat. Expanding urbanization is eating up the habitat of many of these creatures. As exotic garden plants, large expanses of lawn, and roadways replace native vegetation, pollinators lose the resources that are necessary for their survival. The loss of wild lupine from many areas, for example, threatens the endangered karner blue butterfly, which will only lay its eggs on or near this plant. Pesticides are also taking their toll. Insecticides can kill pollinators when sprayed directly, but can also contaminate the plants that pollinators forage on. Pollinators absorb these toxins as they move from flower to flower. Due to their small size, many pollinators can be killed by even small quantities. The flowers’ pollen and nectar can also become contaminated and, when brought back to the nest by female bees as food for her young, also affects the next generation of bees. Herbicides deplete the landscape of "weeds" essential to the pollinator's survival. This is especially true for butterflies, which are dependant on many "weed" species for the survival of their larvae or caterpillars. The monarch butterfly, for example, is unable to survive without the presence of milkweed. We can help ease this pressure and create a pollinators' paradise with some thoughtful gardening and a little planning. Provide the greatest diversity of flowers possible, ensuring there are a number of different flowers in bloom at any time from early spring through the summer and into the fall. Choose flowers with a variety of colours to attract a diversity of pollinators. Blue, yellow and purple flowers, for example, will attract bees. Provide a diversity of flower shapes and sizes. Pollinators vary in size and in the length of their tongues. Short-tongued bees, for example, require shallow flowers in order to reach the nectar, while long-tongued bees can access the nectar of deeper flowers. Choose native flowers that are abundant in nectar and pollen rather than exotic flowers bred for showiness (many of which have diminished nectar and pollen production). Do not collect plants from the wild. This puts pressure on plants already threatened through habitat loss. See the plant encyclopedia and native plant suppliers’ list for help. Add some late-blooming flowers, such as aster, cup plant, or goldenrod, to provide nectar and pollen for pollinators active into the fall, such as bumble bees, monarchs and hummingbirds. A muddy spot will provide essential nutrients to butterflies and nesting materials for some bees. Allow a corner of your yard to go “wild” with grasses, weeds, wildflowers, logs and brush to provide nesting, sheltering and overwintering sites. The availability of nesting sites can seriously limit bee populations. Provide undisturbed, sparsely vegetated soil in warm, well-drained, sandy sites, preferably on a south-facing slope, for ground-nesting bees. If you don’t have a sloping spot in the sun, you can create your own by making a mound of sandy soil that is about 60 cm high and 1.5 m wide when tamped down. If you use mulch in your garden, leave at least some areas that are mulch-free. Logs and old stumps in sunny areas are good for bees that nest in cavities. Shrubs with pithy stems, such as elderberry, raspberry, and sumac, provide nesting sites for some bees such as small carpenter bees. Smaller bees seek out open flowers with easily accessible nectar while larger bees can access more complex flowers. Good flower choices include aster, coneflower, goldenrod, milkweed. Because of their longer tongues, they tend to favour trumpet- or bell-shaped flowers. They are most attracted to red flowers, although they will choose others.